This is by far the best fletching jig on the market today. The jig is made of a high-quality combination of metal and plastic. No more set screws, allen wrenches, or cumbersome knobs to turn! By means of a simple slide switch you can change from 3, 4, or 6 fletch. Can be used in combination with an optional Base Plate to extend the Bearpaw Fletching System to a 3, 6, 9, 12 unit fletching tool. The helical clamps are designed to wrap around the arrow shaft for that perfect fletch job every time. The arrow centers automatically, so you can fletch from the thinnest Axis type shaft to the largest 27/64" aluminum arrow shaft. 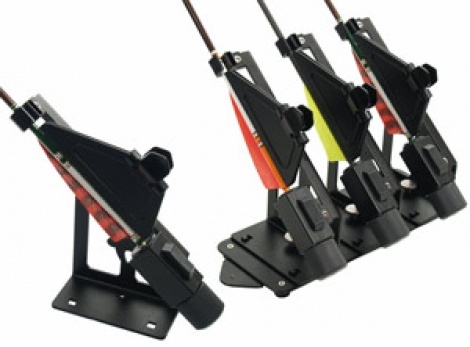 Included with the fletching jig is a Right wing, Left wing, or Straight clamp.